If you’ve read this blog lately, you’ve read a lot of criticism of Republicans for talking economic nonsense, placing their political fortunes ahead of the country’s good, or some combination of the two. But sometimes Democrats, particularly conservative Democrats, do the same things. And now is one of those times. 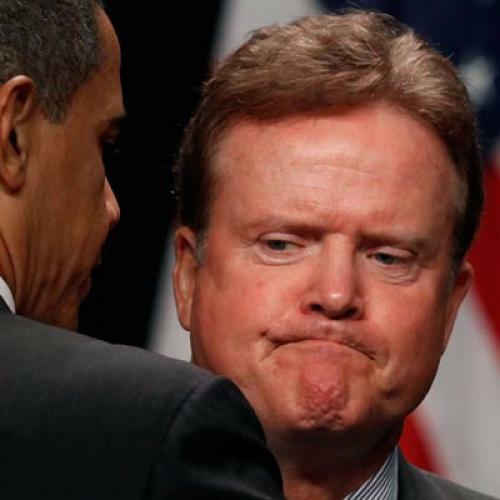 Mary Landrieu and Jim Webb – I’m looking at you. An article by Manu Raju, in Politico, quotes the three senators criticizing Obama’s jobs proposal. Part of the problem is the offsets: In order to pay for the school maintenance, tax breaks, and other efforts at stimulating the economy, Obama has proposed to raise taxes on the wealthy, starting in January 2016, or to have the new congressional super-committee propose an alternative. Apparently this is unacceptable to Landrieu and Webb, who fancy themselves fiscal conservatives but can’t stomach the idea of slightly higher taxes for the very wealthiest Americans. Landrieu represents Louisiana, a very conservative state, and plans to seek reelection – so there’s some political logic to her position. Webb is another story: He’s retiring. The feeling seems to be genuine. And, as Brian Beutler reports, plenty of other conservative Democrats seem to have similar feelings. For what it’s worth, the substantive case for this point of view is exceptionally weak. Most mainstream economists would say what Doug Elmendorf, director of the Congressional Budget Office, and Ben Bernanke, chairman of the Federal Reserve, have been saying: Deficit spending now, to boost the economy, combined with deficit reduction later, to make federal budgets sustainable, is pretty much the ideal policy. Conservative states sometimes elect wishy-washy moderate Democratic senators, but when North Dakota or Alabama sends a Republican to Washington, they send a solid conservative. And while your Scott Browns and Olympia Snowes sometimes don’t vote with the party leadership, they rarely attack the leadership in quasi-personal terms. They don’t suggest that Mitch McConnell has “terrible” ideas that he’s pursuing for low political reasons. Fellow liberals criticize to flay President Obama for avoiding fights – and, sometimes, they are right. But they also underestimate the obstacles Obama faces because of the divided Democratic caucus. It’s not just that conservative Democrats wield an effective veto in Congress; it’s that they are constantly, almost compulsively, disagreeing with the president and undermining the party’s message discipline. Maybe that’s necessary for their political survival and maybe it isn’t. Greg Sargent makes a good case today that Obama's bill is actually popular with independents. And even Max Baucus, hardly a bleeding heart, supports higher taxes on the wealthy. Either way, it does put Obama, and his allies, at a distinct disadvantage. Update: My original item also discussed Delaware Senator Tom Carper, whom the Politico story quotes as saying "I think the best jobs bill that can be passed is a comprehensive long-term deficit-reduction plan. ... That’s better than everything else the president is talking about — combined." But Carper staffers contacted me shortly after the item went live, arguing that their boss was far more enthusiastic about the Obama bill than the article suggested -- that Carper supports the proposal. To make their case, they pointed to other statements Carper has made. After Obama's speech, for example, Carper told the Delaware News-Journal that "From cutting taxes for small businesses to creating more job growth, the American Jobs Act is a strong package that merits bipartisan and bicameral support." Update 2: More Democratic sources, in and around Congress, are pushing back against stories of dissension.